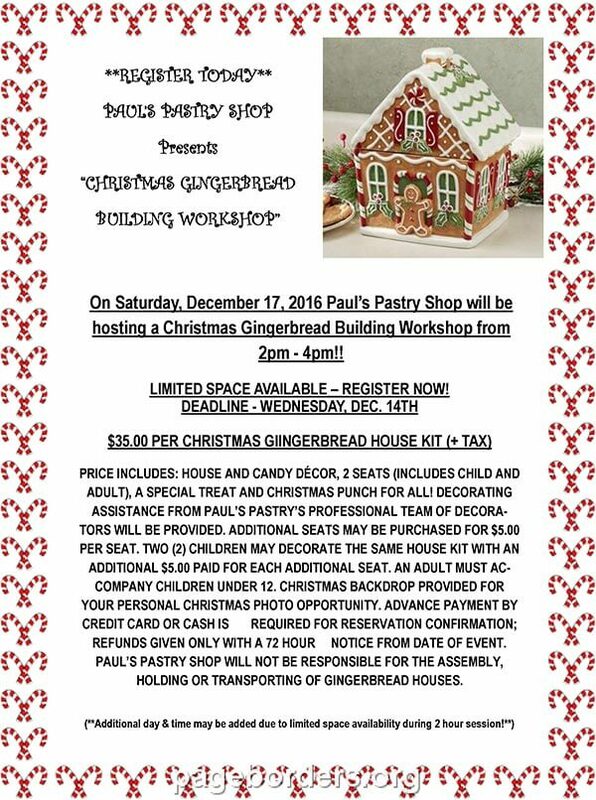 On Saturday, December 17, 2016 Paul’s Pastry Shop will be hosting a Christmas Gingerbread Building Workshop from 2pm – 4pm!! Price includes: House and candy décor, 2 seats (includes child and adult), a special treat and Christmas punch for all! Decorating assistance from Paul’s Pastry’s professional team of decorators will be provided. Additional seats may be purchased for $5.00 per seat. Two (2) children may decorate the same house kit with an additional $5.00 paid for each additional seat. An adult must accompany children under 12. Christmas backdrop provided for your personal Christmas photo opportunity. Advance payment by credit card or cash is required for reservation confirmation; refunds given only with a 72-hour notice from date of event. 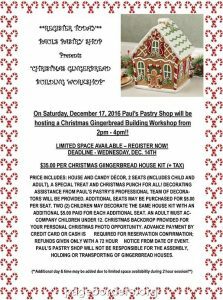 Paul’s Pastry Shop will not be responsible for the assembly, holding or transporting of gingerbread houses. This entry was posted on Monday, November 28th, 2016 at 10:09 am and is filed under Workshops.